The home of quality, affordable and DDoS protected server solutions. All our servers are protected from up to 100Gbps of DDoS attacks utilising Corero's Smartwall technology. Our network consists of the highest quality Tier-1 providers. Including NTT, Telia, GTT, TATA, Cogent and over 400 IX peers. Spin up your very own DDoS protected dedicated server in hours, truely rapid! No contracts, cancel anytime, monthly billing cycles - bare metal hosting made simple. Manage every aspect of your bare metal server via our RESTful API with total control. We support many operating systems, CentOS 6 & 7, Ubuntu 12, 14 & 16, Debian 7 & 8, Windows Server 2008, 2012 & 2016, VMWare ESXi, Proxmox and FreeBSD 9 & 10. Write your own BASH scripts that will be injected into the provisioning process so that your server is delivered ready, whether this be updates or the installation of a web stack. You can see an array of different information via the firewall log, this includes target IP, target port, attack type, total attack size, total pps and the time the attack started. Enable notifications for different types of events. For example if your server is attacked with a DDoS, or in the event of bandwidth overusage, you will be alerted via your chosen method. 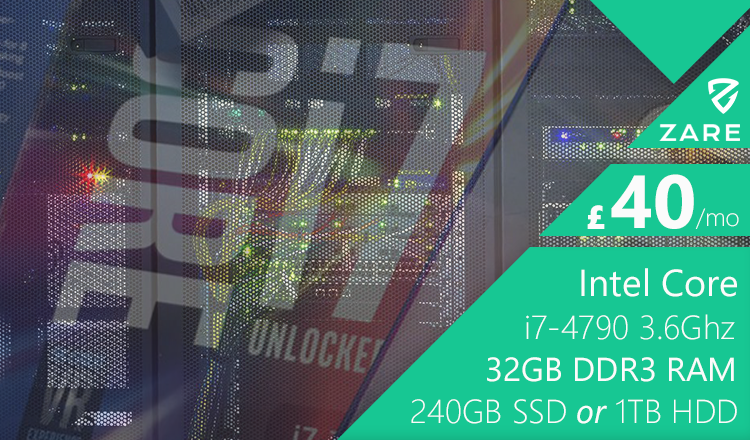 All London dedicated servers are delivered with a dedicated IPMI port which gives you access to iKVM via the manager. This will allow you to access the server at all times. All services are accessible via the Zare RESTful API which allows full integration of our product range into any billing platform or management system. All services are protected with over 100Gbps of protection capacity via our Corero SmartWall appliances. Be assured that your server will stay online, even in the event of the biggest attacks.